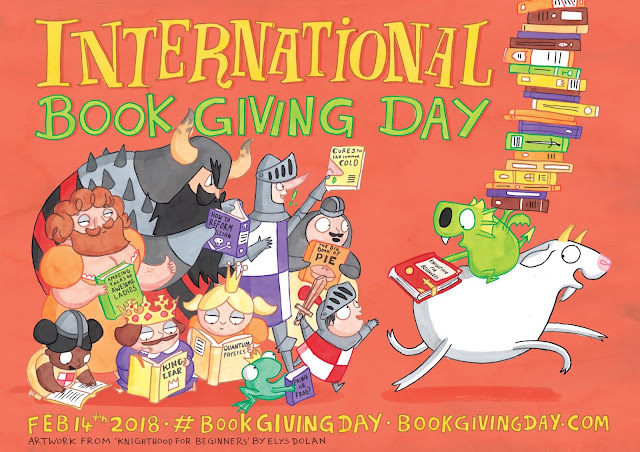 Book Giving Day 2018 Plots and Plans! You know that we are big supporters of Book Giving Day having given away stacks of books over the last two years! This year I have something special planned (and I hope it will work out as I plan but it's still early stages). In the meantime, I am delighted to announce that we will exclusively be revealing some of the wonderful downloadable freebies to help support giving books on Book Giving Day next week! So keep an eye out for that. But for those who don't know, what is Book Giving Day? In addition, we encourage people to support the work of nonprofit organisations (i.e. charities) that work year round to give books to children. Elys Dolan’s poster features an array of fun, book loving characters. Eagle eyed readers will spot some familiar, much loved characters from her illustrated novel, Knighthood for Beginners, (Oxford University Press, 2017). With its fun design and brilliant attention to detail, Dolan’s poster is sure to catch lots of attention. And we can't wait to hear about and see lots of wonderful books being given away to children to celebrate! Keep an eye out on Monday for our exclusive reveal of the book giving day goodies! Is your special plan for the 14th something to do with where we are going on that day? #intrigued. Nope! But looking forward to that! Celebrating the Bard! And a gift for you! White Out! Snow Day Reads! BookBairn is Actually a Penguin!